Should You Accept Mom & Dad’s Facebook Friend Request? No! Sorry, that was my instantaneous response. The above question presents quite the quandary, but, luckily, Mike Newman and Cool Materialhave provided us all with this nifty flowchart. Last we heard, around 48% of parents friend their kids on Facebook. That makes sense — parents love stalking, er, keeping tabs on their pride and joy. But does that mean you have to accept said request — especially if you’re prone to posting embarrassing pics (don’t say we didn’t warn you)? 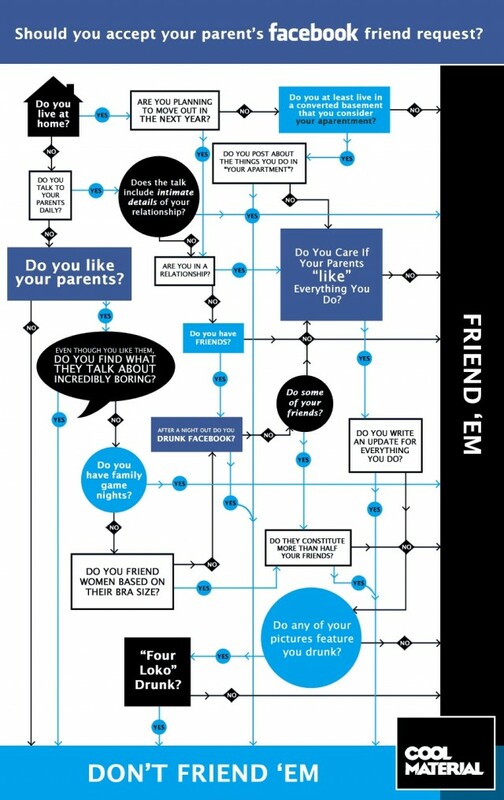 Try out the chart below to see whether you should just avoid, avoid, avoid, or welcome Mom and Dad into your Facebook realm with open arms (or at least a few profile privacy tweaks). 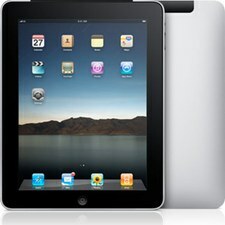 The next iteration of Apple’s iPad might have a front and a rear-facing camera, Reuters reports, citing multiple sources. However, with the tablet race heating up – the market is expected to quadruple by 2012 – Apple might want to surprise us with an unexpected feature or two for the next iPad if it wants to keep its lead ahead of the competition. There’s no denying that Facebook has had an impact on the way the younger set flirt, fall in love and break up. Now,Seventeen magazine has released a study that depicts just what kind of repercussions the social networking site has had on modern courtship. “Teens are incredibly social, and Facebook plays a huge role in their love lives,” says Ann Shoket, editor-in-chief of Seventeenmagazine. According to the study — which polled 10,000 guys and girls ages 16 to 21 — Facebook plays an important part in how amorous teens make a connection. Within one week of meeting a new person, 79% of people click “friend,” and after adding a new friend; 60% of people stalk their crush’s profile once a day (40% check in on their would-be soulmate several times a day). Moreover, contrary to beliefs that social networking is erroding interpersonal communication, 72% of those surveyed said that talking to someone online brings you closer to them IRL. As we have already seen in other studies, Facebook also plays a role in how we fall out of love. Mashablewriter Samuel Axon wrote a detailed feature about how Facebook has changed dating for the worse, Facebook dating app AreYouInterested released a study in which 21% of respondents said they would break up with someone via changing their statuses, and, most recently, infographic wizard David McCandless came out witha chart that shows popular breakup periods by way of status updates. Seventeen, for its part, reports that 10% of people have been dumped over Facebook, and the same number would just change their relationship status to “single” to cut a lover loose. The report also depicts the anguish the site can cause after a breakup, citing that 27% of people change their connection to their exes after a breakup via blocking (get Ex-Blocker for that extra push), hiding him or her on the News Feed or unfriending. Surprisingly, 73% of people keep their exes in the friends list. I’d like to see some stats on how many of those 73% stalk said ex after the breakup. Girls are more judgmental: 43% of girls would decide not to date someone based on their Facebook profile, compared to 33% of guys. Guys are more likely to keep relationship statuses under wraps: 17% of guys don’t share their status, compared to 12% of girls. Girls think it’s exciting to change their relationship status: 50% of girls get a kick out of the status change — one-third of guys agree; 24% of guys find it unnecessary, compared to 17% of girls. What do you think? Has Facebook affected your love life?